Few things match the rich, savory, cheesy goodness of a Chicago-style deep-dish pizza, but the world is trying. Many regions around the globe created their own versions of this American pie with a thick crust, cheese, sauce and toppings. Variations on the formula can even include pies without sauce, lacking cheese or using different toppings, but the thick crust unites deep-dish pizzas around the world. What Makes a Deep-Dish Pizza? Deep-Dish: The standard deep-dish pie is baked in a pan and has a thick layer of toppings over a focaccia-like crust. Typical crusts line the sides and bottom of the pan, allowing for the cheese and chunky sauce and toppings to fill the bowl-like creation of a thick bottom crust. Stuffed Deep-Dish: At Giordano’s, we make the filling stuffed deep-dish version of Chicago pie. We put the crust in the bottom of the pan followed by toppings — yes, we know they’re really not toppings when they’re on the bottom — cheese, a second thin crust and sauce. The unusual stuffed creation makes for a hearty meal you will have a hard time finding outside of Chicago. When you crave a deep dish pie in Sicily, head toward a bakery called a panificio. Inside, you’ll find bakers serving up squares of an unusual deep-dish creation called sfincione. Sfincione — yes, it’s spelled that way — has a thick crust, like a deep-dish pie, but that’s where the similarities end. The bread has a fried base from oil in the bottom of the pan, but the bread’s texture has an airiness that perfectly absorbs the flavor of the oil from the pan and the toppings. Unlike Chicago pie, which uses mozzarella, you won’t find any of this melty cheese atop sfincione. The lack of cows’ milk cheese on this pie originated from Sicily’s reliance on goat and sheep for cheese production. The hard cheeses produced from these animals’ milk were cheaper than cows’ milk cheeses. Sfincione has always been a way to use cheap ingredients to make a tasty meal, so hard, long-lasting grating cheeses became the norm. The sauce used is not a standard sauce found in the United States. Sfincione features a thick combination of tomato, onion and anchovies for its sauce. Have some breath mints handy after eating this dish. Atop the sauce, bakers put a sprinkling of hard cheese and breadcrumbs. If you order a thick-crust pizza in the United States, you may be served a Sicilian pie, if you’re in New York. This regional variation has its roots in Italy’s sfincione, but American influences have changed the pie into something unique. Though sfincione was the inspiration for Sicilian pizza in New York, the crust is where the similarities end. Sfincione has a small amount of hard cheese sprinkled on top, but Sicilian pie in the United States features thick layers of both tomato sauce and melty mozzarella. With an oiled base and pan baking method, this dish has many similarities to a Chicago deep-dish pie — except Sicilian pizza in New York is baked in a rectangular pan and cut into squares. Depending on where you get New York Sicilian-style pie, the cheese may be shredded and put on top of the sauce or sliced and put under it. If the mozzarella used is sliced and layered under the sauce, it’s referred to as an “upside-down Sicilian.” Sometimes pizzerias use additional toppings like pepperoni. Like New York-style Sicilian-style pies, tomato pies in the United States got their inspiration from sfincione. The crust is the same fluffy focaccia-type crust found in sfincione recipes, but unlike the Italian dish, the sauce is the most important part of a tomato pie. In Philadelphia and other parts of the northeastern United States that make tomato pies, the sauce is often called tomato gravy. The crust is baked in a rectangular pan in a brick oven at a low heat. After cooking, the only cheese used on the Philadelphia version of tomato pie is a sprinkling of Romano or Parmesan. Tomato pies are cut into squares for serving at room temperature or while still hot. Other parts of the Northeast, like New Jersey, combine the concepts of tomato pie with Neapolitan pizza. Unlike Philadelphia tomato pies, New Jersey ones are baked in a round pan. New Jersey-style pies also use more toppings and cheese compared to the Philadelphia version. The amount of toppings and cheese is the subject of the rivalry between the states of Pennsylvania and New Jersey and their respective pies. Rhode Island has its own version of tomato pie, too. Instead of cutting the pie into squares, it’s sliced into strips. This cutting method gives the Rhode Island version its name of “pizza strips.” There is no cheese on top, aside from the typical dusting of Parmesan cheese. While some tomato pies are served warm, pizza strips are served cold. Their bite-sized shape makes these strips the ideal food for birthdays and other gatherings. And that’s how Rhode Islanders enjoy these. People often have preferences for pieces cut from the middle or from the edges, but the debate of middle or edge can only be settled on a personal level. If you get the chance to try pizza strips, enjoy them from both places to decide whether you are a middle or an edge lover. In New England, you’ll find a style of pizza that sits between thin crust and deep dish. New England Greek-style pie refers to a hand-stretched, no-knead dough that is baked in a well-oiled pan. The crust has a texture like focaccia, except the bottom is crunchy. Some chefs insist on Crisco for greasing the pan to achieve the pie’s famous crunch. The toppings include copious amounts of rich, cooked tomato sauce spiked with oregano. Unlike other tomato sauces, the one used for Greek pies uses the tangy, concentrated flavor of tomato paste instead of tomato sauce. After saucing the dough, the cook sprinkles on equal parts of mozzarella and white cheddar. Occasionally, workers at houses of pizza — as Greek immigrants named their pizzerias — add provolone into the cheese mix. Most pizza shops stop at this stage, refusing to add any other toppings. The topped pizza bakes at 500 degrees Fahrenheit until it’s cooked through. While you have the options of meat and vegetable toppings, the heavy layers of cheese and sauce may overpower them. If you crave a New England Greek pie, head to a pizza house. The establishment’s name indicates it serves Greek pizza and not Italian pies, which come from pizzerias. Greek pizza houses are scattered throughout New York and New England, where the immigrants from Greece settled and took over the pizzerias of retiring Italian-Americans. Owning a pizza house was such a popular profession for immigrants that 76 percent of Greek-Americans in Connecticut participated in a pizza business. For a uniquely American melting pot of flavors, head down to Tampa for scachatta. This Floridian city is the only place in the country you can get the Cuban-Sicilian-American pie. While it shares many similarities with tomato pies found in the Northeast, the Cuban influence in Florida can be tasted in the additions of corn or cassava flour in the thick crust. Additionally, many places use a rich, egg-based dough. The Cuban influence means the sauce has extra spices and ground beef cooked into it. No other tomato pie incorporates meat into the sauce, making scachatta a unique dish. Like tomato pies, scachatta is often cut into squares. If you’re looking for this version of pie, pass by the pizzerias and head toward a Cuban-Italian bakery. There, you’ll find scachatta served in bakery cases with other regional specialties like Cuban bread and pastries. When you purchase scachatta, don’t heat it. The pie is meant to be eaten at room temperature, like other pastries. Detroit-style pizza starts with a thick crust baked in a rectangular pan. The pan is important to the cooking because the properly seasoned pans don’t require the copious amounts of oil used in other pan pizza recipes. This makes the pizza less oily on the bottom, but not less flavorful. Deep-dish pizza is not only an American institution. Our neighbors to the north have a tradition of piling toppings high atop thick crusts to create hearty pizzas that will satisfy any appetite. Regina-style pie, also called prairie-style, is a staple of the Canadian province of Saskatchewan. The dish can reach up to three inches tall with its heaping mound of toppings. The base, though thick like a Chicago-style deep-dish, is much denser than its American counterpart. The crust combines a standard crust with a biscuit dough to make a unique base for the pie. Greek seasonings add a tang to the sauce, while toppings go over the sauce. The cheese layer is last, blanketing the entire dish. If you go to Malta, you may find thick-crust pizzas referred to as ftira, which is also the name of the bread. Sometimes the dish has a thinner crust, especially on Malta’s sister island of Gozo. The toppings are unlike anything you may have seen on a pizza before. Potatoes, capers, olives and cheese from the islands are used as toppings and make ftira pizza unique. Deep-dish pies with cheese don’t always need sauce. Several places around the world flavor bread with cheese and other toppings. For instance, Argentina has fugazza and fugazzeta, both of which use thick crusts and cheese but not the tomato sauce Americans are familiar with. When looking for a dish similar to Chicago-style stuffed pie, you will find a close relation in fugazzeta. In Argentina, natives have a version of focaccia called fugazza. When the recipe for fugazza is altered to make the bread portion thicker and stuff it with mozzarella cheese, the pie become fugazzeta. While it does not have tomato sauce, like American deep-dish pizzas have, fugazzeta has the same bready, cheesy goodness of pizza. The top of fugazzeta typically has cooked sweet onions. What makes Argentinian pies, including fugazzeta unique is the large amount of cheese piled on it. For instance, a large fugazzeta pie averages two pounds of cheese. 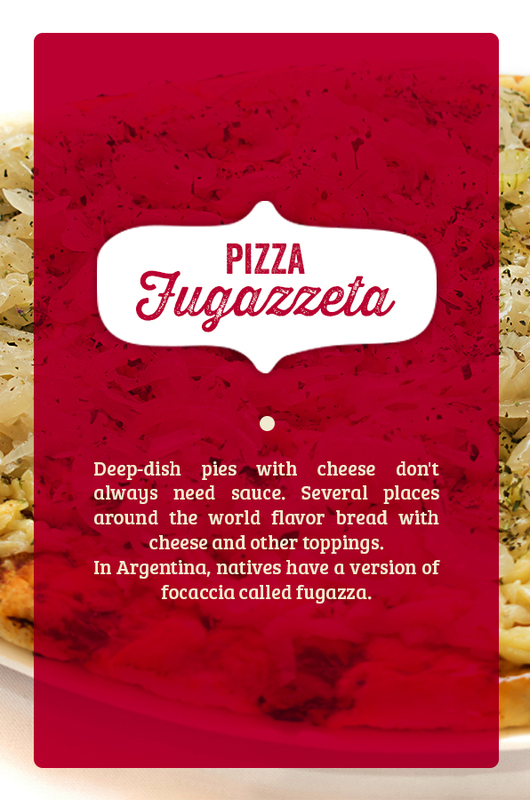 With its hearty filling, fugazzeta has more similarities to our stuffed Chicago pizza compared to pizza in other countries. Pizza technically is like an open-faced sandwich or a single-layer pie. Think about these pies made on top of French bread or bagel halves. These dishes have thick crusts like deep-dish pies without the need to bake a dough before adding toppings to it. While you could call a French bread pizza an open-faced sandwich, its toppings make it more like a pizza. Using this definition of a single-sided sandwich topped with tomato sauce and cheese, this dish appears in unusual places, like as the street food of Poland. In Poland, you’ll see people on the street devouring not hot dogs, like in America, but open-faced French bread sandwiches, resembling thick-crust pizzas. These treats are called zapiekanki when pluralized. The toppings are familiar to those who enjoy American pizza. Cheese, mushrooms and ketchup are commonly used. Variations of this food resemble the alternative pies found in the United States. For instance, you can get a Hawaiian-style option with pineapple. Greek-style zapiekanka have olives and feta cheese. After taking your pallet on a tour of pizza from other countries and in different cultures, come back home to Giordano’s for genuine Chicago deep-dish pizza. Our signature dish started back in Italy with Mama Giordano creating her version of a stuffed deep-dish pie that would become famous in nearby Torino. The recipe was passed down through the family to brothers Efran and Joseph Boglio, who founded Giordano’s in 1974. Unlike these other deep-dish pizzas, our pie has a distinctive stuffed formation. It was such a special creation that Mama called it “Italian Easter Pie.” Today, you can get this pie any time of year, for an exceptional treat you won’t soon forget. With a unique recipe that stands out from other Chicago pies, you will find the taste you’ve been craving when you have our stuffed deep-dish pizza. Stop by one of our locations today. Not near one of our restaurants? Don’t worry. We ship our pies all over the United States. If you want the unique flavor found only in our stuffed pies, pick Giordano’s for your next deep-dish fix.